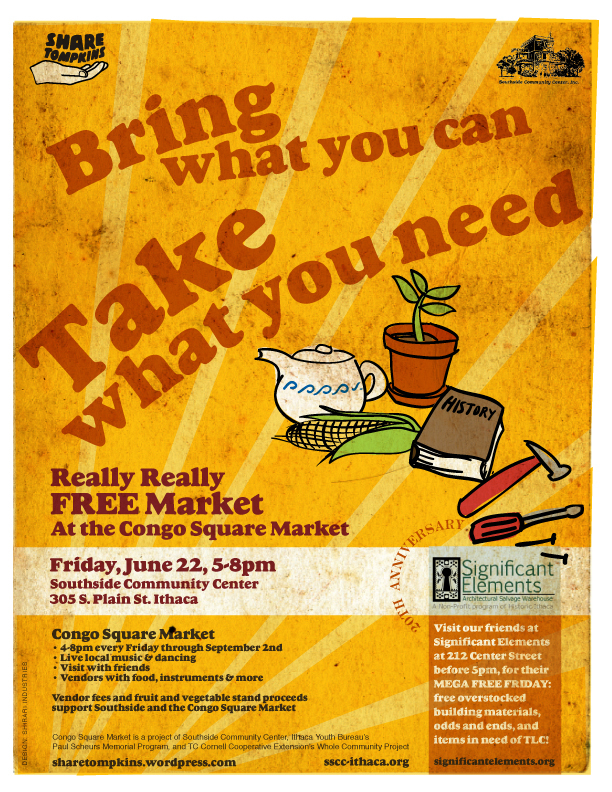 Don’t forget, this Friday, 4-8pm at Congo Square Market at Southside Community Center, we’ll be hosting a Really Really Free Market. Bring stuff to give away, or just bring an empty tote bag and fill it up. I know we’re planning on bringing a lot of stuff ourselves, including housewares and office supplies – come take it so we don’t have to bring it back home! Click here for more info about the event, RSVP on Facebook, and please tell your friends. Ready to share? Come on down to the Congo Square Market to get some food, check out local vendors, and share with your neighbors! In the Share Tompkins Really Really Free Market area, everything is free! Event partners include Southside Community Center, Ithaca Freeskool, Local First Ithaca, and Ithaca Hours. How it works: There will be tables set up where you can drop off your stuff. All are welcome to take whatever they want on a first-come, first-serve basis. This is an opportunity to help one another meet our needs while reducing waste and helping the environment! – Anything you want to share! All left over items will be donated, but it will help the organizers tremendously if you plan to take home any items you bring that aren’t picked up by others. CONGO SQUARE is an actual place in new Orleans. This sacred ground was first used by Houma Native Americans and later by slaves in the region, as a place to enjoy one day of freedom. African people used this as a place to maintain a connection to their true status as free people of Africa. Native Americans, as well as Europeans often joined in the celebration. Music, abolitionist organization, food, and dance were all intertwined to make this one day a week festival. Today, we recreate our own version of this splendor at Southside Community Center. We welcome our WHOLE COMMUNITY to come enjoy food, music and culture. The Market is a collaboration between Southside Community Center, Ithaca Youth Bureau’s Paul Scheurs Memorial Program, TC Cornell Cooperative Extension’s Whole Community Project, and the Youth Farm Project. Mark your calendars, get out your knitting needles, brush off your art sets! Bring arts, crafts, food, and anything to swap or give away. Tell your friends, tell your families, tell your former enemies! To get involved or for more information, contact Danny Bowers at dannybowers@gmail.com. Share Tompkins’ fourth Really Really Free Market is part of the Congo Square Market! Food, books, electronics, clothes – EVERYTHING in the RRFM area is free. Bring what you can, take what you need. The more we can provide for one another locally, the closer we are to sustainability! – Please bring items that are in good condition, no junk. – Please plan on taking back home with you any stuff you bring that is not picked up by others. This event is hosted and co-presented by Southside Community Center. Our partner is Significant Elements, who are celebrating their 20th Anniversary with a Mega Free Friday on the 22nd and additional events (see below). Stop by their store at 212 Center Street before 5pm for even more free stuff! The Congo Square Market takes place 4-8pm every Friday through September 2 and features live local music & dancing, visiting with friends and vendors selling food, instruments & more. Vendor fees and fruit and vegetable stand proceeds support Southside and the Congo Square Market. Named for the famous Congo Square in New Orleans, the market honors African-American history. In the early days of US slavery, recently enslaved African peoples and others could gather in Congo Square for music, dance, and stories. The Ithaca Congo Square Market is a project of Southside Community Center, Ithaca Youth Bureau’s Paul Scheurs Memorial Program, and Tompkins County Cornell Cooperative Extension’s Whole Community Project. Historic Ithaca launched the Significant Elements architectural salvage program in 1991 as a seasonal, all-volunteer program to keep reusable house parts and building materials out of the landfill. Today, Significant Elements is a year-round, staffed program with over 7,000 customers annually. It has grown into a community resource for materials, product and contractor recommendations, hands-on training, and professional expertise. On April 27th, we were invited to speak about Share Tompkins as part of the panel discussion following the community screening of the film The Economics of Happiness. Like sharing? All are welcome to come to this organizers’ meeting to plan for the next few months of Share Tompkins events. We’ll also discuss strategies for reaching new people, partnering with other groups and generating press. Feel free to bring snacks (vegan) or drinks to share. If you’d like to get involved but can’t come to the meeting, let us know! RSVP for the event on Facebook. Bring what you can, take what you need. 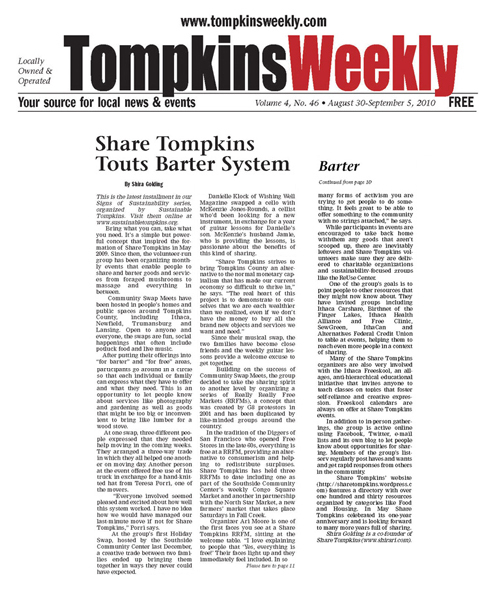 It’s a simple but powerful concept that inspired the formation of Share Tompkins in May 2009. Since then, the volunteer-run group has been organizing monthly events that enable people to share and barter goods and services from foraged mushrooms to massage and everything in between. 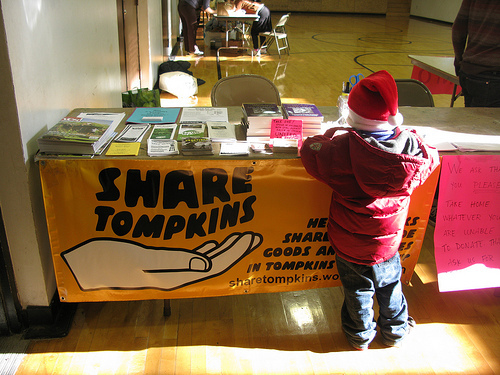 Community Swap Meets have been hosted in people’s homes and public spaces around Tompkins County, including Ithaca, Newfield, Trumansburg and Lansing. 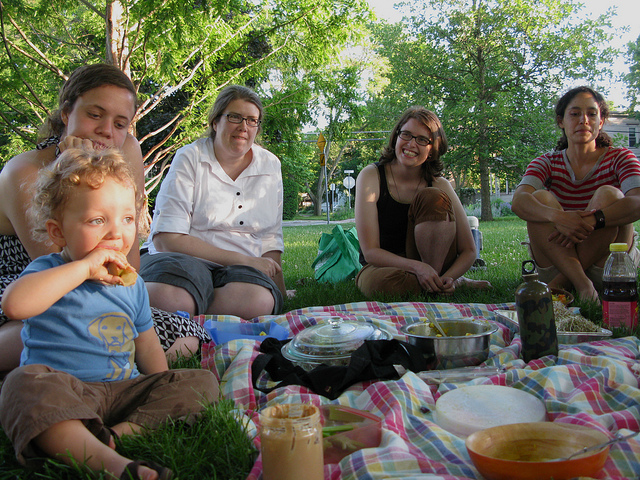 Open to anyone and everyone, the swaps are fun, social happenings that often include potluck food and live music. that might be too big or inconvenient to bring like lumber for a wood stove. Thanks to everyone who came out and shared today and thanks to Phoebe at The Shop and Northstar House for partnering with us for this event! 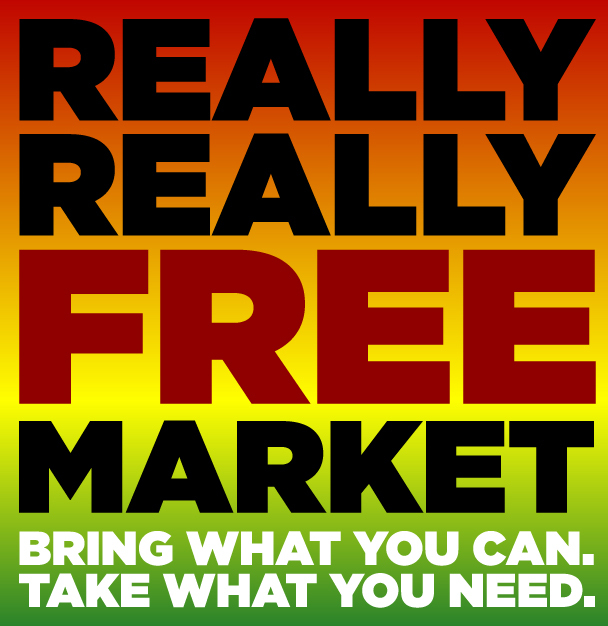 Share Tompkins’ third Really Really Free Market is part of the new Fall Creek North Star Market! Food, books, electronics, clothes – EVERYTHING in the RRFM area is free. Bring what you can, take what you need. The more we can provide for one another locally, the closer we are to sustainability! The North Star Market takes place every Saturday from 10am-4pm outside the Northstar House (the old Fall Creek cinema lot on E. Falls street). Offerings include coffee and tea by The Shop Cafe, produce from Burdock Farm (Alpine, NY), baked goods and bread by Edgewood Bakery, and Re-Cycle Bike Repair by Nis. Acoustic musicians are also encouraged to come down and play! You can post haves/wants to the Wall of Facebook event or to the Share Tompkins email list. Join the Share Tompkins Facebook group. For more info about the North Star Market contact northstarmkt@gmail.com. Become a Fan of The Shop. Please spread the word even if you can’t come!